I must admit, I wasn’t a fan of bitter melon before either. But over the years I’ve been really getting used to its unique taste and I now eat it quite regularly. Having learned so much about this versatile fruit, I think it deserves a boost. So let’s find out more the health benefits of bitter melon and its culinary possibilities. Karela, Bitter Gourd, Gōyā or Balsam Pear? Momordica charantia in latin, bitter melon is a (sub)tropical plant (a vine) originating from India. The plant is now widely grown in large parts of Asia, Africa and the Caribbean, primarily for its nutritious and bitter tasting fruit. The fruit however, is not one that you would typically like to eat raw, because of the bitter taste. The plant can grow up to 5 meters in length and typically blooms during the summer months and fruits during fall. The bitter melon fruit is usually eaten in its early stages, when it is green, or still a bit yellow. The flesh is watery, similar to cucumber and kiwano fruit and has a bitter taste. As the fruit ripens, it turns orange with the flesh becoming more bitter. Depending on where it’s grown, the bitter melon fruit comes in different varieties. The Chinese variety for example, is larger, wider and smoother than the Indian variety. The Indian variety is pointier and has a somewhat rougher skin. In Asian culture, bitter melon has been a very popular fruit for centuries. The fruit excels as a versatile ingredient in many curry and stir fry recipes, but also in soups and herbal teas. The other reason why bitter melon has always been so popular is that it’s been widely used in traditional medicine. It’s believed that bitter melon can be used to combat diabetes, to treat skin diseases and to promote healthy digestion. What’s in a name? Bitter melon goes by so many names, that it does get a bit confusing. The most common names used for this fruit are bitter melon, karela, bitter gourd or balsam pear. But it’s also referred to as gōyā, african cucumber, ampalaya, or simply bitter cucumber. Gōyā is the Japanese name for bitter melon, often used as a tasty ingredient in Japanese dishes. Karela is the name that’s most used in India. As a tea, bitter melon is often referred to as Gohyah tea. Bitter melon has a rich nutritional profile with a variety of nutrients, vitamins and minerals. Below is a summary of the most important nutrients in bitter melon. It is particularly rich in dietary fiber, potassium, calcium, vitamin A, vitamin C and folate. Another benefit of bitter melon that’s worth mentioning is that it’s very low in sodium and cholesterol. What are some of the most important health benefits of bitter melon? The biggest claimed health benefit of bitter melon is that it helps to control diabetes. The bitter melon fruit contains compounds that supposedly have an hypoglycemic effect, which means that it helps to control blood sugar levels. These compounds assist in the transportation of glucose from the blood into the cells, and is therefore beneficial for type 2 diabetes patients. However, before rushing into a bitter melon diet, it is strongly recommended to consult a medical practitioner. It is important to have a good understanding of how much you can have and also what the potential side effects are of consuming (too much) bitter melon. 100 Grams of bitter melon contains nearly half your recommended daily intake of vitamin C, a powerful antioxidant that strengthens your immune system. Vitamin B6 is an essential vitamin that helps with many functions in our body, such as making antibodies, maintaining a normal nerve function and breaking down proteins. Bitter melon is also rich in potassium, calcium, vitamin A, and folate, to name a few. The powerful anti-oxidants and high levels of vitamins A and C helps to prevent premature skin ageing and is believed to relieve skin conditions such as acne and psoriasis. Bitter melon is a great source of dietary fiber which helps to improve digestion. Even if you don’t suffer from any form of constipation, you still need sufficient fiber. Dietary fiber works as a natural laxative so that consumed food moves nicely through your intestines, thus preventing constipation and promoting healthy gut bacteria. The bitter melon fruit has a strong nutritional profile and contains powerful chemicals that can have positive effects on our body. But there’s also a need to be cautious, especially if you’re planning to consumer bitter lemon long-term. If you’re diabetic and you’re using medication, you should ask your doctor how the consumption of bitter melon will affect blood sugar levels. It is important to understand how your medication works and whether it is safe to consume bitter melon. Too low blood sugar levels can be dangerous. Pregnant women should also stay away from bitter melon, as it can stimulate excess menstrual bleeding. Women who breastfeed should also be cautious. Young children should also not eat bitter melon – especially the seeds can have a potentially toxic effect. If the taste of bitter melon really puts you off so much that you just can’t eat it, then maybe you could try bitter melon tea. Bitter melon tea, often sold as gohyah tea, is a herbal tea made with infused dried bitter melon slices. The tea version still has a bitter taste but it’s not as intimidating or overwhelming as the taste of fresh bitter melon. The tea is often promoted as a traditional medicinal tea offering the same health benefits as fresh bitter melon. Amazon sells a wide range of different gohyah tea brands, but be sure to check the reviews before purchasing. To make it even easier, you can also enjoy the benefits of this fruit by taking bitter melon supplements. 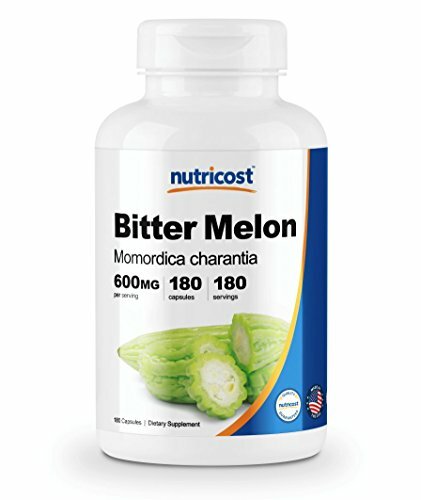 Have a look at Amazon for bitter melon powder and bitter melon capsules. Eating bitter melon by itself is not for everyone because it’s so bitter. But the complex yet tasty flavors of this fruit have established bitter melon as a tasty and versatile ingredient in Asian cuisine for centuries. The bitterness of the fruit works really well when countered with spicy or sweet flavors. Check out these 3 recipes with bitter melon. A refreshing, very Asian-style dish, with ground pork, and fermented black beans and fish sauce. Stir frying is probably the best way for people to “accept” bitter melon and its bitter flavor. This recipe mixes bitter melon with ground pork, served in fish sauce wit garlic, black beans and red chilies. Yum! A simple yet delicious recipe with bitter melon, scrambled eggs, chopped tomatoes, bacon, garlic and onion, served with rice. Great for breakfast! Bitter melon is certainly not the first ingredient you’d think of when preparing your next juice or green smoothie, but as long as you counter it with sweeter ingredients, you can’t go wrong. Check out this green smoothie recipe with bitter melon, ginger, turmeric, bananas, cinnamon, pears and olive oil. If you find that this recipe is still too bitter, simply add more fruit to make it taste a bit sweeter. It’s clear that the health benefits of bitter melon are very strong. If you’ve never eaten bitter melon before, or you don’t eat it as often, then hopefully this post has encouraged you to add this versatile fruit to your diet. Besides its strong nutritional profile, karela lends itself really well as an ingredient in recipes because of its unique taste. Excited about tropical fruits as much as I am? Check out my list of 20 exotic fruits that you should try at least once in your life!